A staple in cafes around the world, Thonet's steam-bent No 14 chair is T in the alphabetical list of iconic seats we're publishing each day until Christmas. The company established by German designer Michael Thonet in 1819 has sold millions of his most-famous chair since it was introduced in 1859. Also known as the bistro chair and 214, the design is formed from six pieces of beechwood that are heated with steam, pressed into curved cast-iron moulds and then dried in the desired shape. Later versions had two diagonal supports added on either side to help brace the seat and back. Its seat is woven from raffia to create a porous surface that would allow spilt liquid to drain through. The pieces of 36 disassembled No 14s and the screws needed to build them could be packed into a box measuring one cubic metre and shipped internationally, marking the beginnings of flat-pack furniture. Modernist architect Le Corbusier said: "Never was a better and more elegant design and a more precisely crafted and practical item created." Thonet began his career as a wood craftsman in the Rhine valley, where he set up his first furniture workshop. Austrian Prince Metternich invited him to Vienna and urged him to relocate there after seeing his work at the Koblenz fair in 1841. A year later, an Austrian court granted Thonet the right "to bend any type of wood, even the most brittle, into the desired forms and curves by chemical and mechanical means". A second, nonrenewable 13-year patent "for manufacturing chairs and table legs of bent wood, the curvature of which is effected through the agency of steam or boiling liquids" was given in 1856. It wasn't long before the fashionable cafes around Vienna were furnished with the simple steam-bent wooden chairs. The No 14 chair became the most popular of Thonet's designs and received a gold medal when it was shown at the 1867 World Exposition in Paris. 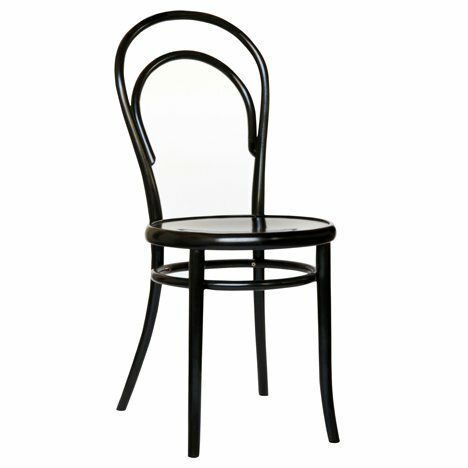 The technique for bending solid wood that Thonet developed in the 1950s enabled the design to become the first industrial product to be mass produced at a low cost. One hundred and fifty five years after it was first created, the No 14 chair can still be found in homes, bistros and restaurants across the world. Design journalist Alice Rawsthorn wrote that it "is thought to have seated more people than any other chair in history". The chair has also served as a reference for numerous contemporary designers including James Irvine – Thonet's creative director from 2007 to 2011 – who reinterpreted the design chair as an edition to be sold by Japanese brand Muji in 2009.